The sublimated process allows you to achieve a very sharp look. 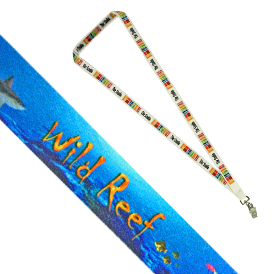 Full color photographic images can be reproduced onto this type of lanyard. Sublimated lanyards also have a soft flexible feel. Printing on 1 side or both sides using same image. Imprint size: Design can bleed to edges. For a different image on each side, add a 0.20 (A) run charge and a 150.00 (G) set-up charge.